Ten Speed Press, 9781580083034, 304pp. A cookbook and market guide from the nation’s premier neighborhood grocery store, featuring expert advice on how to identify the top ingredients in any supermarket and 90 vibrant recipes that make optimal use of the goods. 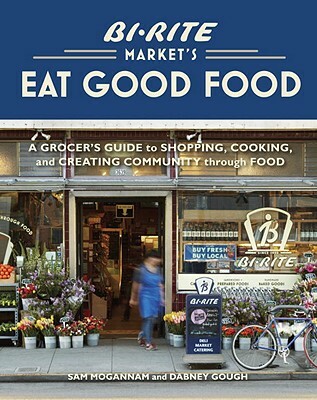 More engaging than a field guide and more informative than a standard cookbook, and with primers on cooking techniques and anecdotes that will entertain, enlighten, and inspire, Eat Good Food will revolutionize the way home cooks shop and eat. Sam Mogannam is the second-generation owner of Bi-Rite Market and founder of the Bi-Rite family of businesses, which includes Bi-Rite Creamery, 18 Reasons, and Bi-Rite Farms. He also serves on the board of the National Association for the Specialty Food Trade. Sam has been featured in Food & Wine, Bon Appétit, Sunset, and the San Francisco Chronicle, and programs such as Foodcrafters. Sam stepped into the family grocery business in 1997, after working as a chef at his own restaurant, and transformed the market into a culinary landmark. Dabney Gough is a graduate of California Culinary Academy, a former columnist with the San Francisco Chronicle, and a contributor to Fine Cooking and the Honolulu Weekly. She is the co-author of the forthcoming Bi-Rite Creamery’s Sweet Cream and Sugar Cones and lives in Honolulu, Hawaii. France Ruffenach’s photography has appeared in countless books, magazines, and commercial campaigns. She has been twice nominated for the James Beard Award for best photography, and won in 2008 for her work on The Country Cooking of France. She lives in San Francisco.